We are in full party-planning mode here at our house! If you can believe it, I am crazy enough to plan a friend party and a family party in addition to Little Man's regular birthday and Valentine's Day all in the same week! I must be nuts! But it will make for an entire week's worth of celebration to brighten up our winter days. Little Man has requested a Mickey Mouse birthday party. But here is my struggle: I love love love Mickey Mouse. But trying to re-invent a Mickey Mouse birthday party has been tricky for me. We are attempting to add an original twist to some classic Mickey ideas! 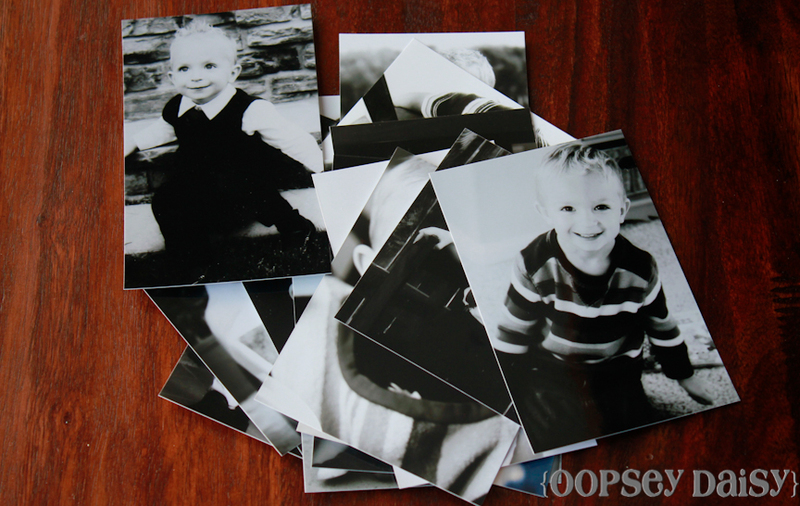 The first project on my list was creating a way to display some photos of Little Man over the last year or so. 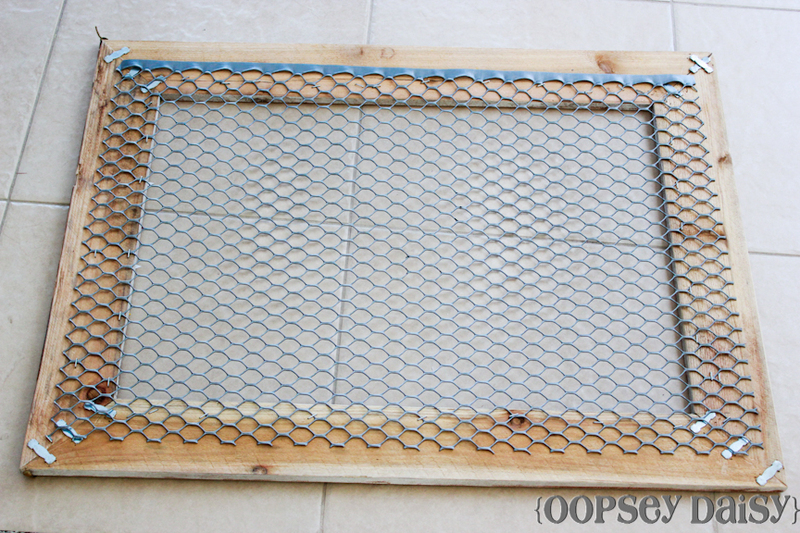 So we set out to create our very own DIY chicken wire frame! I'm proud to say that we whipped this up from scratch! 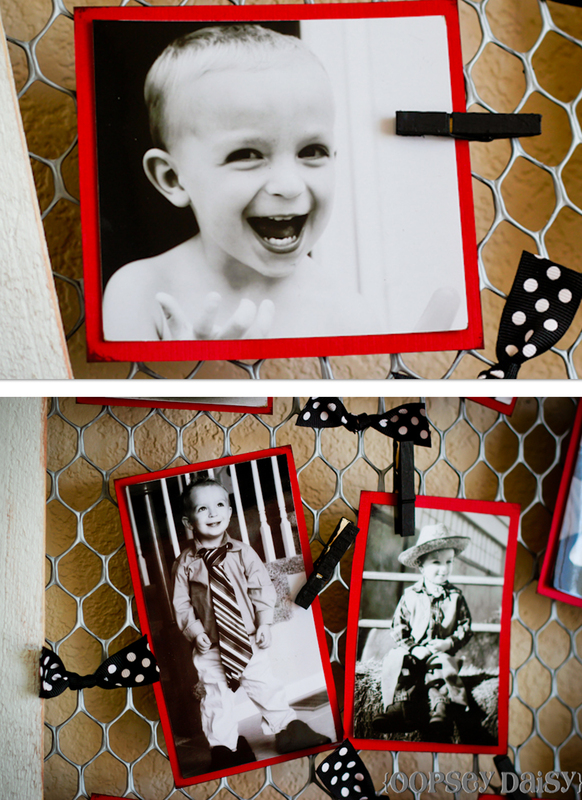 And this will be so simple to customize for different occasions to display different photos, momentos, or even Christmas cards! 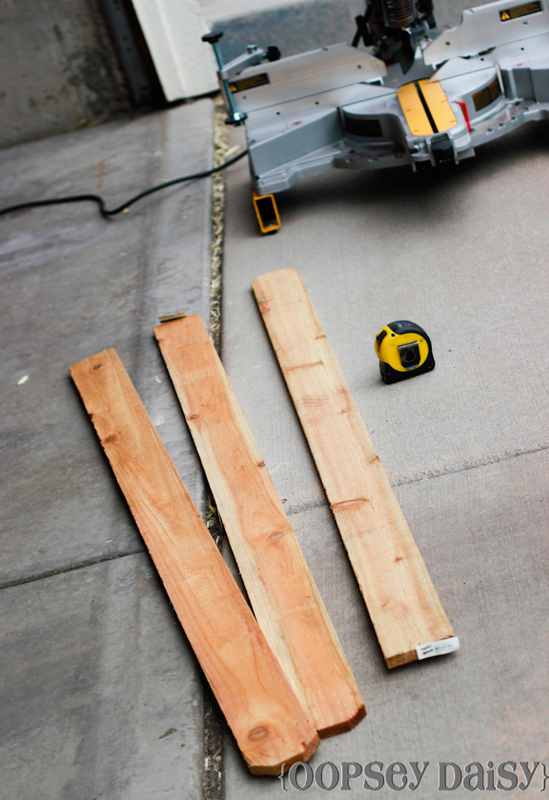 I started with 3 pieces of wood about 1x4. 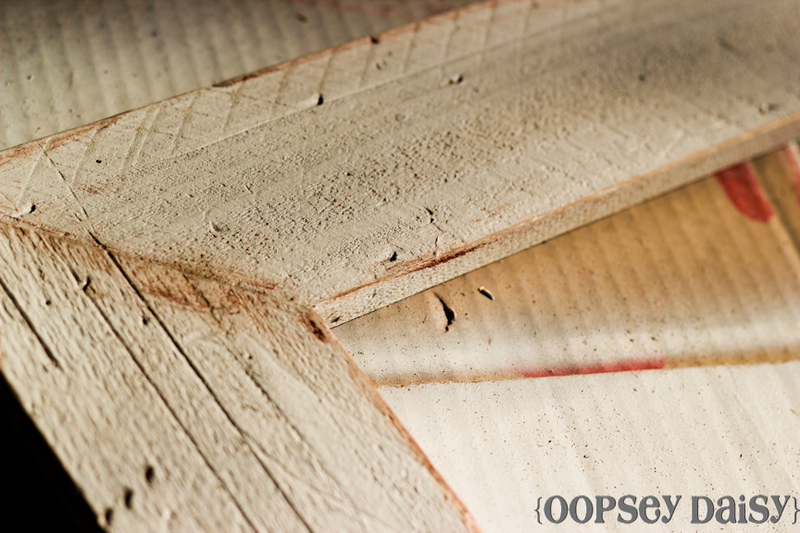 This was the cheap wood at Home Depot. We were going for rustic! 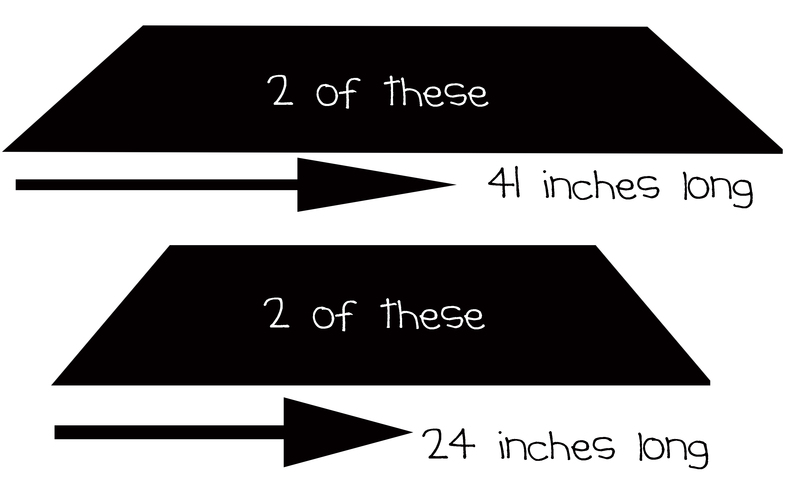 We cut 4 pieces of wood according to the measurements above, each at 45 degree angles. I almost wish I had made this even bigger, but we definitely maximized our 3 planks of wood! 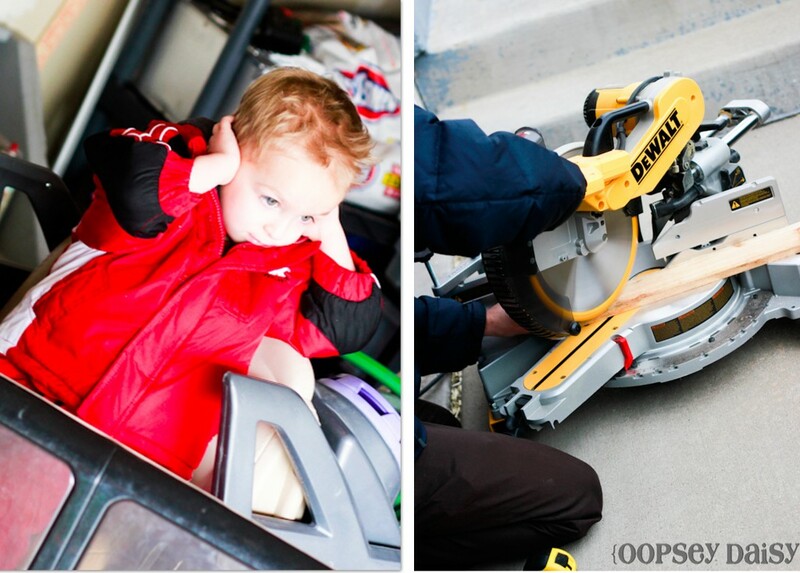 Hubby sawed while Little Man covered his ears! He has always hated the sound of the saw! Not bad, eh? Mr. oopsey daisy did a fantastic job with the power tools as usual. One of these days, I'm going to get over my fear of losing a limb and cowboy up and use some power tools myself! 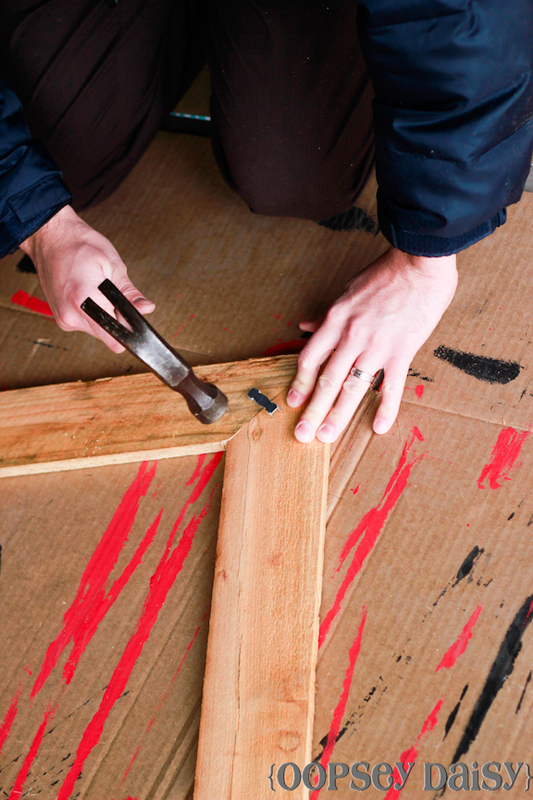 We secured the 4 sides of the frame together by using gorilla glue. 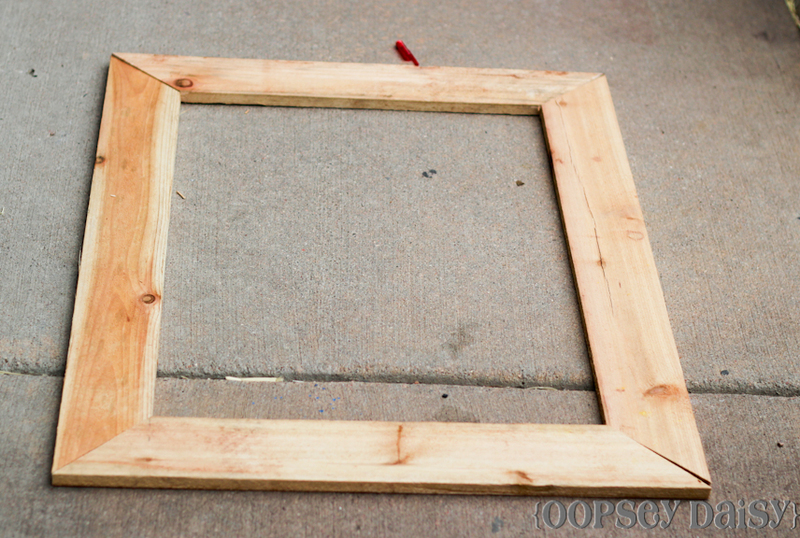 And just to be sure it was secure, we used these wood joiners to hold the frame together, too. Before painting, I distressed the wood. It really is great anger management to drive nails and screws aimlessly into wood! 🙂 Next, I primed and painted the frame. It needed plenty of coats to show the white well, but I loved how it turned out! To add to the distressed look, I just used a rag to smudge brown pain along the edges and corners. As quickly as I rubbed it on, I would rub it off again. You know I love a good photo project, and I couldn't resist here either! I developed several (more than I needed) of my favorite photos of Little Man in black and white. I mounted them on red cardstock to match our party colors. 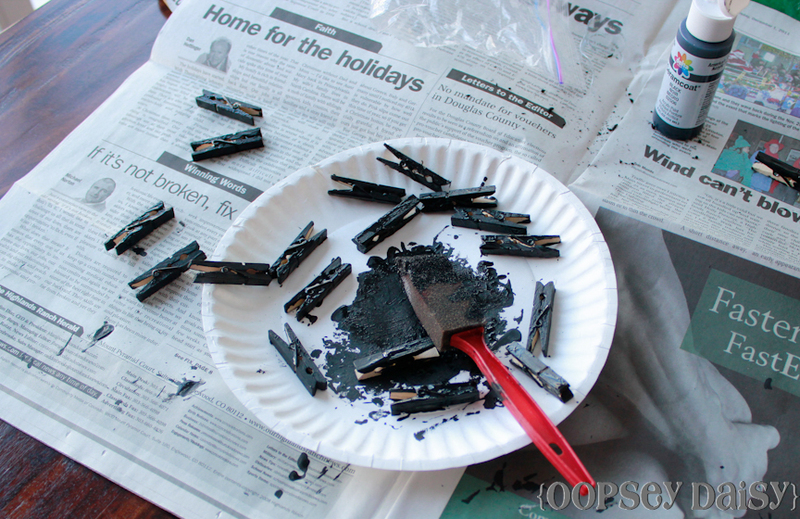 Meanwhile, I painted some small clothespins black. Darn that snow blizzard! I had to paint indoors! I added a fun pennant with some scrapbook papers leftover from the invitations and tied some polkadot ribbons to the frame to add the finishing touches! Is there anything better than pictures of the ones you love?! Little Man helped me select which photos to put up in the frame! This will definitely be making an appearance at Little Man's big birthday party! Now if I can just figure out what we're actually doing at the party! I do love throwing a party! Love this Alison! It turned out gorgeous 🙂 Sharing it on my FB page!! SO cute! I had no idea making these was so easy! This is on my to-do list for sure! Thanks for sharing! Love it, Allison! I love photo display ideas of any kind…so cute! That is awesome! 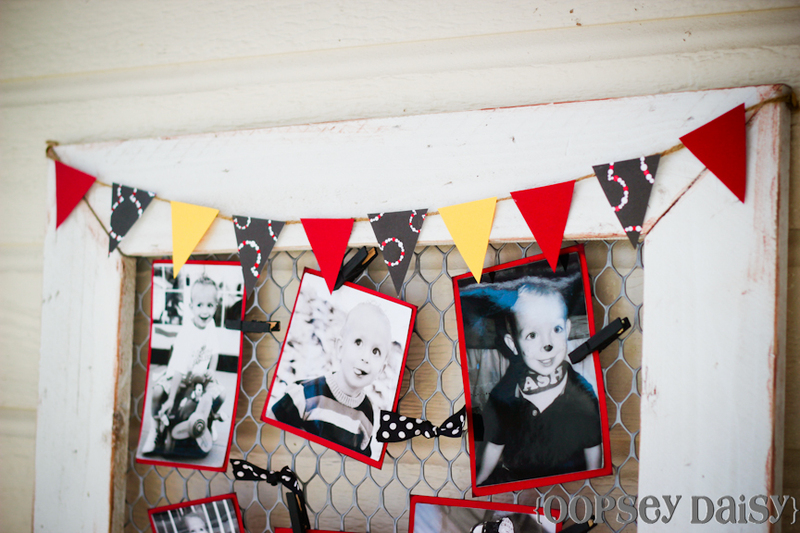 I cannot wait to see the details from Little Man’s party. You always do such a fabulous job! Very cute–I love the banner and your little guy is adorable!!! Ooooh! I love that look! And that frame could be used over and over with different color schemes too. Great job! I am in LOVE with this project! ADORABLE! This is so adorable. What a lucky guy to have such a great mama!! 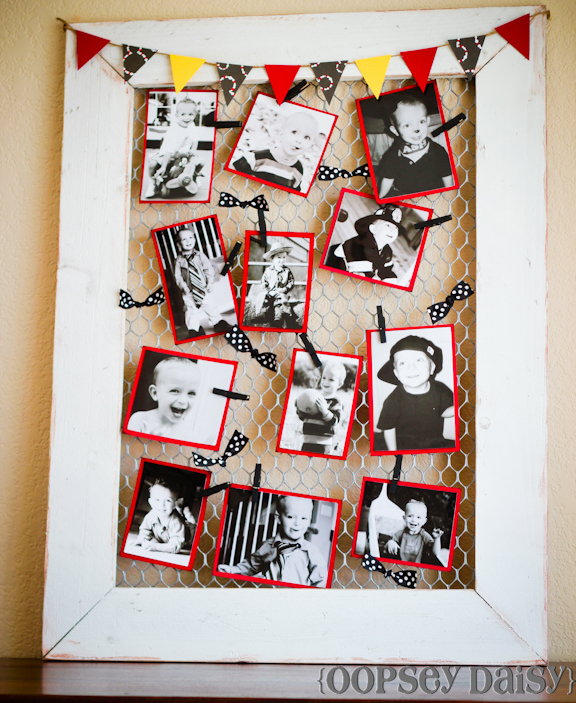 Can I tell you how much I LOVE this chicken wire frame? I LOVE IT. I’d love for you to share it at my VERY FIRST link party. It looks great! I really like the way you did the frame! I have been wanting to make one of the for my kitchen for a while now, but have had a hard time finding the right frame. I never thought of making one myself! Thanks for sharing! Oohhh I’ve been thinking of doing something like this for a wall in our kitchen…I love this one!! 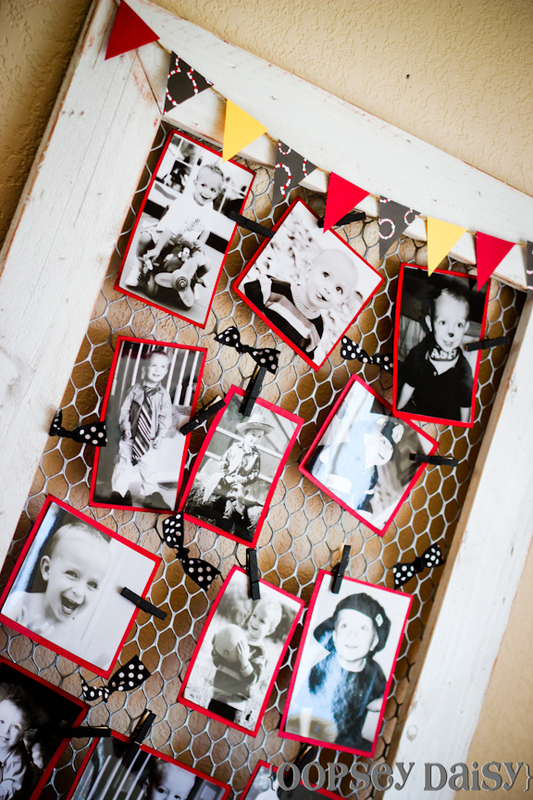 They way you tied all the photos together with the black clothespins and red paper-it looks awesome!!! Love chicken wire! You even made the frame! 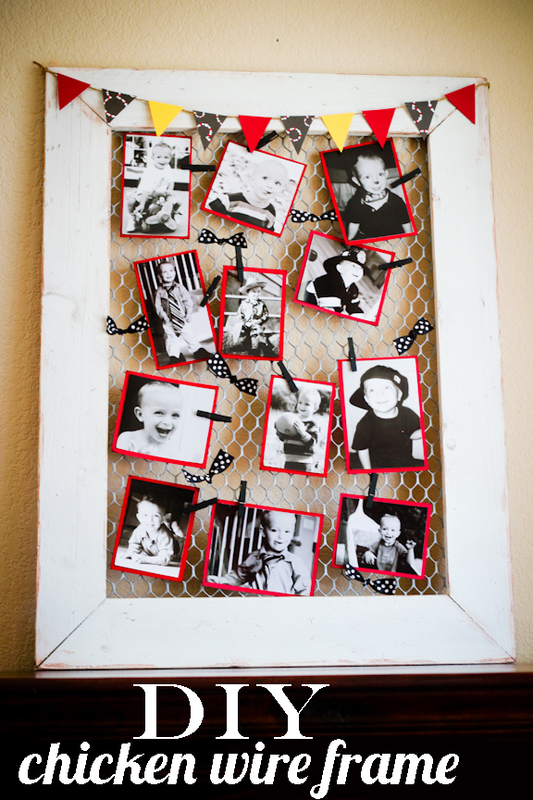 I made my sister a chicken wire frame for Christmas, but I used a frame I found at Ross and just took the print and glass out. And then wouldn’t ya know it I got so caught up in my crafting that I took NO before, during or even after pictures for the blog. Blowin’ it. It was awesome though. Filled it with pictures of us from my wedding day. I adore this! I am obsessed with chicken wire right now. Looks great! Saw you on the weekend wrap up. This is absolutely adorable!! I found you through TT&J, and I’m so glad I did!! Love your blog! I love this, it is such a great idea. And the colors are so great. Cute! Especially love that you made the frame. Love the pennant and the ribbon tied to the wire! Hi Stacey! I just used white Krylon spray paint. I hope that helps! Just white Krylon spray paint, and you can choose if you want flat or glossy or semi-gloss finish. I believe I used flat. 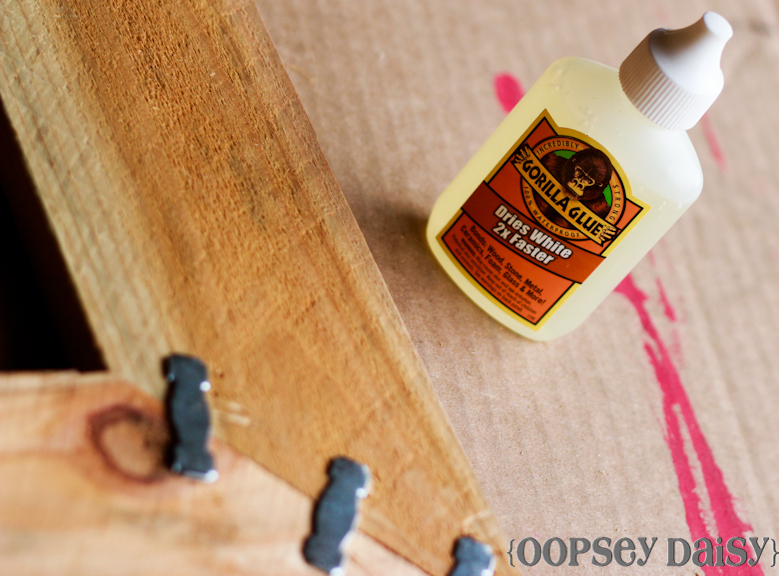 Be sure to prime first, because the raw wood is VERY thirsty and soaks up that paint! Driving nails and screws into for a distressed look…..absolutely freaking brilliant! LOVE that idea! Why have I never thought of this? !